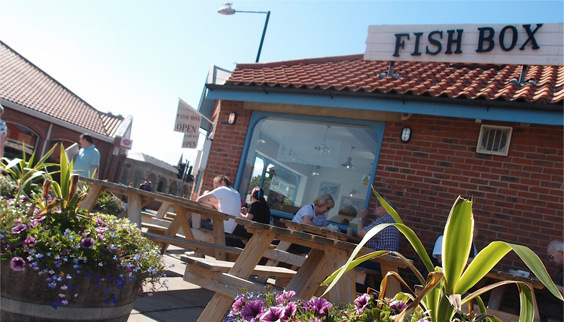 Fishbox® is a one of a kind ‘express style’ fish and chip shop, with takeaway seating inside and out. The meals are all one price – so you can choose – outside when it’s sunny and warm. Or when the North wind is blowing, keep snug, warm and dry while you eat our delicious fish and chips in the restaurant. Fishbox® is part of Fusco’s – so you will be getting the same high-quality award-winning fish and chips as our other outlets – Quayside and Royal Fisheries. Fish Box uses 100% compostable packaging in both shops, so customers can rest assured that all the packaging used is eco- friendly. Fish Box® Whitby, opened in 2013, is bright and contemporary, serving traditional seaside fish and chips made with sustainably-sourced ingredients – the perfect place to take all the family. 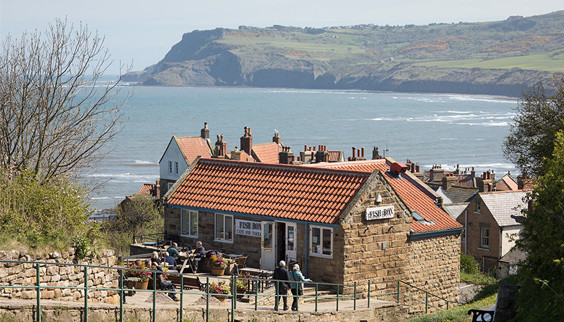 Fish Box® Robin Hood’s Bay was opened in March 2016, serving the same quality traditional fish and chips as our Whitby restaurant and takeaway.